The impressive lake-view pool, which reflects the blue of the sky and the lake, and the large sundeck, which blends naturally with the colours of the ancient local stone, accompany our guests in their moments of complete relaxation. A fragrant rose garden crowns the surrounding English meadow, with double-delight, sun-coloured roses and varieties of citrus plants: bergamot, orange, tangerine, and delicate cedar. Your experience will continue after sunset, when the ancient stone walls, lemon trees and floral varieties are lit up like a crown around the pool, creating a magical atmosphere of times gone by. 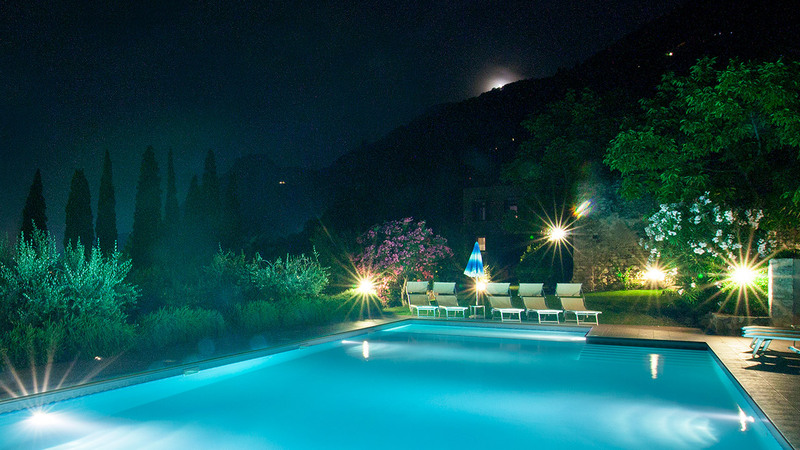 to admire the moon and the stars above Lake Garda, from the edge of the pool in an ancient lemon grove.